In the wise words of Barack Seamus O’Bama, Is Feidir Linn! And yes we can! Himself and Michelle had a whirlwind visit to Moneygall for a quick pint of the black stuff (Michelle loooves the stuff) the up to Dublin to give us a good aul talk. Some called it a bit condescending others thought it was complete American arrogancy however Jedwards performance afterwards made up for it! For the past 2 weeks Ireland, mainly Dublin, has been on lockdown as we welcomed the President of the US of A to our Emereld Isle and mere few days after Ireland’s long lost cousin Lizzy O’Windsor popped over to work on her tan! After her free breakfast in Avalon she darted off to Bray for a splash around with Prince Phillip then apent hours on the dance machine in the local amusements! Most of us hailed the hostoric visits, others cried in frustaration at parking restrictions and not being able to cross the feckin river however the general mood was high in a time of depression. However the best was yet to come! 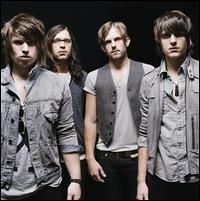 This saturday sees the arrival of…even more famous/sexier than Queen Liz…The Kings of Leon!! The Followill brothers and co will headline this years Slane Castle concert to an already sold-out crowd of 120,000 fans! Better hope the weather picks up!